You know the drill by now: An unknown phone number with your area code sparks the hope that a long-lost lover is reaching out and you will, in fact, be married by 30. But upon answering, these hopes are dashed. You're talking to a robot who is both ineligible and scamming you. It's a frustrating experience, and a lot of people just ignore unknown numbers now because of it. Well, bad news: It's going to get worse. 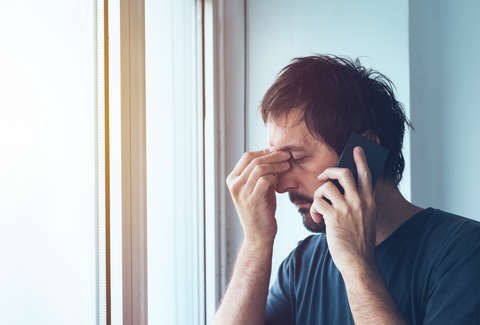 According to a report by First Orion, a call management and protection company, the percentage of scam calls in the US is expected to reach 44.6% in 2019. That percentage already rose from 3.7% last year to 29.3% this year. Let that sink in, and then never answer the phone again. An increasingly popular scam is what's called "neighborhood spoofing," which uses your actual area code to trick you. There are some third-party call-blocking apps that filter out known scam numbers, but if a person's actual phone number is being used, these apps don't help. This can also lead to you calling that number back, speaking to the person whose number was appropriated, and having a very confusing interaction (or possibly an elaborate meet-cute?). As of now, there's no end in sight for this kind of robocalling. "Year after year, the scam call epidemic bombards consumers at record-breaking levels, surpassing the previous year and scammers increasingly invade our privacy at new extremes," Charles D. Morgan, CEO and Head Data Scientist of First Orion told CNET. "Recently, the FCC joined forces with several technology companies, including First Orion, to find a way to combat these calls, but we still see rampant increases. After working closely with several carriers, we've found that in-network solutions that leverage sophisticated data analysis and machine learning are by far the most accurate way to pinpoint the origin of a call and identify it before it reaches your phone." In other words, there are some leads right now, and both the government and companies like First Orion are working on solutions. But for the time being, it looks like it's just going to get worse. So maybe let's just phase out the phone call for good?